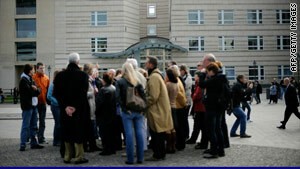 Tourists stand in front of the U.S. Embassy in Berlin, Germany, on Monday. Sidiqi reveals encrypted e-mail site called "Mujahedeen Secrets"
Hamburg, Germany (CNN) -- The man at the center of an alleged al Qaeda plot to bomb cities in Europe has told investigators the conspiracy was directed by one of the organization's most senior figures, according to European intelligence officials. Little is known about Mauretani, but he is thought to be from North Africa and involved with al Qaeda's "external operations." He is thought to be in the tribal areas on the Pakistan/Afghan border. German European intelligence officials say Sidiqi has revealed that Mauretani planned to come to Europe with two other Germans to prepare the attacks. The two Germans were part of the group Sidiqi traveled with from Hamburg in the spring of 2009. One was Naamen Meziche, a French citizen of Algerian descent, and the other was Shahab Dashti, a German Iranian. According to Sidiqi both were involved in the conspiracy, a European counterterrorism official told CNN. That official said German authorities have begun checking Sidiqi's claims with information from another member of the Hamburg group in custody in Germany. He is Rami Makanesi, a German of Syrian descent who was deported to Germany in August after being arrested by Pakistani authorities close to the tribal areas in June. The official says some of Sidiqi's information matches; some does not. Makanesi has been charged with receiving terrorist training, German officials tell CNN. He has not entered a plea. According to the officials, Sidiqi said that Mauretani had instructed Meziche, Dashti and himself in how to communicate securely on the internet. He showed them how to use an encrypted e-mail communication site called "Mujahedeen Secrets." The European counterterrorism official told CNN that Sidiqi's account of his meeting with Mauretani was circulated to European intelligences services four to six weeks ago. Sidiqi had also told his American captors he met with Said Bahaji, a close associate of the 9/11 hijackers in the Afghanistan-Pakistan border region. Bahaji is believed still at large in the area. There are around 40 Germans believed still to be with jihadist groups in the tribal areas of Pakistan, according to German intelligence officials. More than 200 militants have traveled from Germany to the Afghanistan-Pakistan since the 1990s, and most of them are believed to have received training, according to German intelligence officials. Mauretani's alleged role in the plot was first reported by Der Spiegel magazine in Germany.